Technically, pastels are pure pigment with a binder formed into a round or square stick. 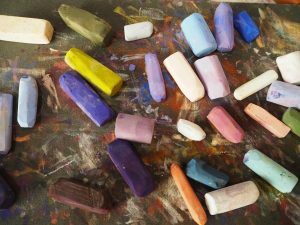 The pigments are identical to what’s used in oils and other artistic media. They are applied by hand to a “support” – a rough, toothy surface that holds the pastel, often a sanded paper. Pastel has been used for centuries. Painting by such famous names as Degas and Manet are still vibrant. I’ve been told that a pastel painting (properly executed) will last longer than a piece in oils. That’s because there is no oil binder to deteriorate. 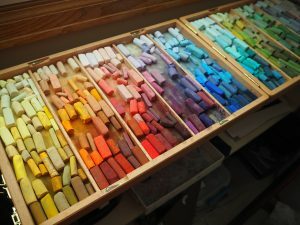 Soft pastels come in thousands of colors. But the artist can “mix” colors by layering different strokes on the support. It’s one way that pastel painting excites the eye. Of course, a pastel stick is dry and applied directly by hand. And many artists do draw with pastels. The difference between painting and drawing is a thin line (pun intended). In my work, I start most works with a wet pastel under-painting, accomplished by applying swaths of pastel and then using a brush with alcohol over the pigment. But many pastel artists who never use a brush call their work “paintings” as they build form and value with strokes, as opposed to drawing lines.